do-17 z-7 has moving guns. Though i dont understand why they REMOVE the gun movement in hangar/tarmac. 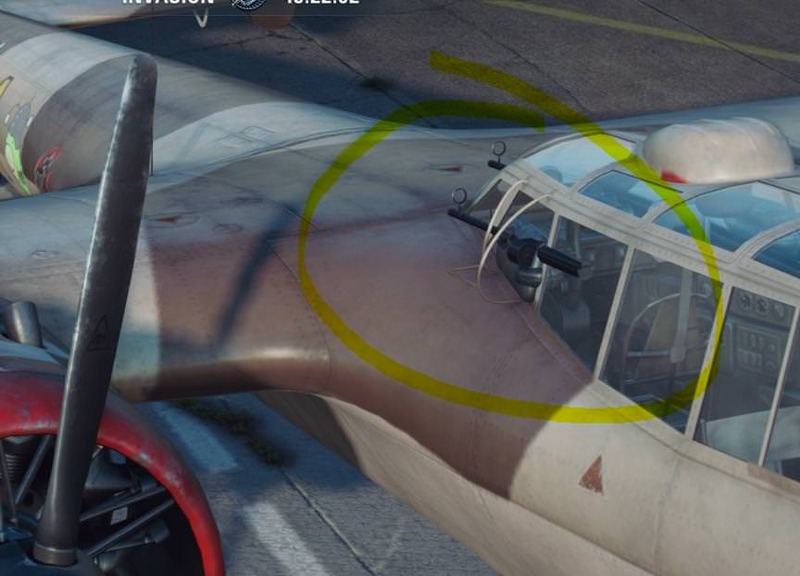 plase ADD gun movement for all secondary gun(ners), for all airplanes in garage. that way its visible to see the gun constraints. there are still other aircraft that have secondary gun movement in "garage". dont remove it, add it. that way, the gun elevation, depression and side angles are visualised. it makes rear gunner fire and view arcs visible in hangar, which can only improve battles. So.. do not remove movement in garage, because it has no gunner in garage. add the freaking gunner! Edited by Tha_Truth, 28 February 2018 - 06:38 PM. Edited by sultanyusuf, 28 February 2018 - 09:31 PM. I call people out for literally killing the game and they say "BRAH LOOK AT YOU STATS THEY SO BAD GIT GUD". Well guess what. Now I am good, because I can shoot straight and read the map instead of flying to 4,000m, dive and click. And I play against people who have played as long as you instead of clubbing newbies over and over. So I say to you clowns, Git Gud, or Git Gone. Edited by Exhall, 28 February 2018 - 11:21 PM. You make my day Happy with this. Sure maybe you are good >NOW<, but only after Massive downgrade. WoW. Kid you are so simple, this game it's not Killed by Player Base more from WGs amateur developers and not least the Bad Management who make their diplomas in pawn shops.His first lesson in all business schools, never chase away the payment basis. We begin this game with over 10k player, and WG bringing one Downgrade after another.This my Young Padawan kill the Game, not the small Group of Rookiehunter. Edited by I_Icelander_I, 01 March 2018 - 07:45 AM. And still no anniversary mission for the planes, it was promised RIGHT after 2.0 update??? WG FAIL again. yeah, i put in tickets asking them to fix the crashes to desktop. and like i posted earlier. they should add it for all ai-controlled guns. so you can see how far the guns can move, or at least get an idea (assuming that some people don't imediatly understand or have the knowledge). And: fix the crashes to desktop. Prioritise that over fixing any other bug. everytime it crashes, you potentially lose a player /payer. Edited by Tha_Truth, 02 March 2018 - 03:23 AM. Is the UK specific mission "Last Line of Defense" for the free hangar slot supposed to reset overnight? I was half way to the 30k XP points yesterday, today I'm back at zero. Most annoying and it makes the mission too difficult for just a hangar slot. Edited by Teach59, 03 March 2018 - 11:55 AM. Of course, so as before 2.0. 90% of Tester told WG 2.0 in this form is fully crap. Oh come on most of us not believe more the WG fairy tale. Edited by I_Icelander_I, 04 March 2018 - 04:21 PM. Got my first 2 badges for participating in the combat phase of Operation Westwall, only to find my Skies of Albion badges are missing ???? anyone else had have the same issue ?? What hapaned with game?after the end mision westwall the game gone crazy,no slot in hangar,i can t change aircraft on hangar to play,result after battle no apair,what the hell is wrong with you wg?and fix the crash game,i pay to play no to admire my desktop! Edited by EduEGA, 05 March 2018 - 06:12 PM. Well same problems here,but i don t have any hope to wg solve this problems,ram with the planes?? ?no tank you,dezinstal and play IL2 Sturmovik! Has anyone had freeze problem lately, my hangar can load sometimes,tech tree also? Just buy the Meteor,thats all what they want from you ! bugs,freezes ect. .....who cares! Same here,after end the westwall mision my game gone crazy,i can not choose which plane i want to play,after the fight is over, the results of the fight do not arise, when I enter the developed branch there is no airplane, i have no free space on hangar,totaly dezastru!